Hey, remember when airlines used to provide snacks or meals on every flight? That doesn’t happen on domestic flights anymore — unless you’re a fancy first class passenger — but it thankfully still occurs on international flights (okay, maybe not flights from Chicago to, say, Toronto, but you get it). So why am I talking about plane food? I just got back from a ten day trip to Ireland. Prior to leaving, I was told by more than one person that Ireland is a beautiful place. They’re not kidding! We contacted the airline prior to our departure to request a vegetarian meal. Note: VEGETARIAN, not vegan. You can also request a vegan/non-dairy meal. That said, the special meals that I got were vegan as far as I could tell. What was also interesting is that one of the two options for the rest of the passengers was vegetarian, which is great! For our flight to Dublin, my entree was a Curried Garbanzo Bean Medley. It came with a side salad, including balsamic vinaigrette dressing, a roll, and honeydew wedges. I just love these little salad dressings. For the record, everyone else got a French dressing. I give the entree 4 out of 5 stars. It was really tasty and surprisingly spicy, and I was glad to have a great protein source. The rice was good as was the broccoli, but I felt like some of the carrots were too mushy. Anyone averse to Indian flavors like cumin would not have liked it at all. In that moment, I was grateful that I found the dish tasty and gave myself a pat on the back for being a non-picky eater. As I mentioned earlier, one of the options for everyone else was a vegetarian pasta. It looked good and wasn’t creamy or cheesy, so I would have eaten it. And on another day, I may have preferred it. But the great thing about these special meals is that the special diet is considered in all the meal components. There is no butter for the roll, a non-dairy salad dressing is provided, and the dessert is fruit! 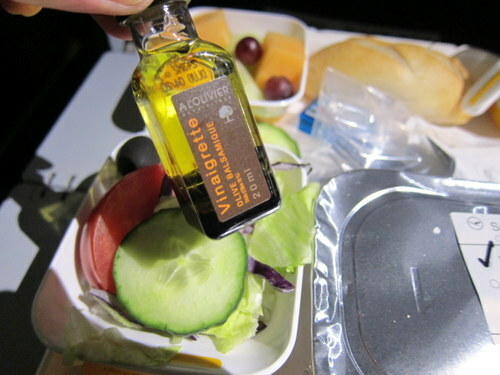 FRUIT IS AWESOME, especially on long flights – and makes requesting a special meal worth it! It was also much healthier than the 150 calorie cookie given to everyone else. 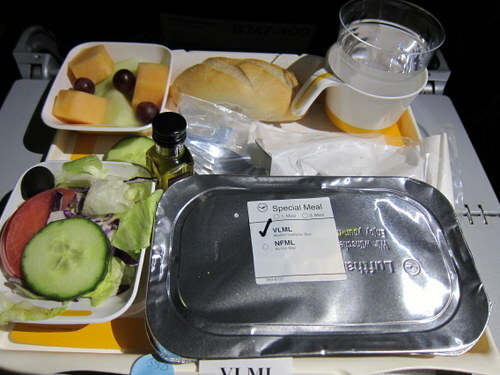 Even though it should be a no-brainer, I’m happy that airlines provide special meals without any hassle or added fees. It makes traveling, especially overseas, a much more pleasant experience. You also get your food before everyone else, which is pretty nice.